There are a few places to provide custom messaging throughout the shopping experience in your store. Upon arrival, display a welcoming message that will appear above your store products. To avoid crowding your products, keep it simple! Include your school name and logo. Share why it's important to support and contribute to your organization. Have much to say? Consider including a link to a webpage. See an Example of the "Learn why" link from the image below. 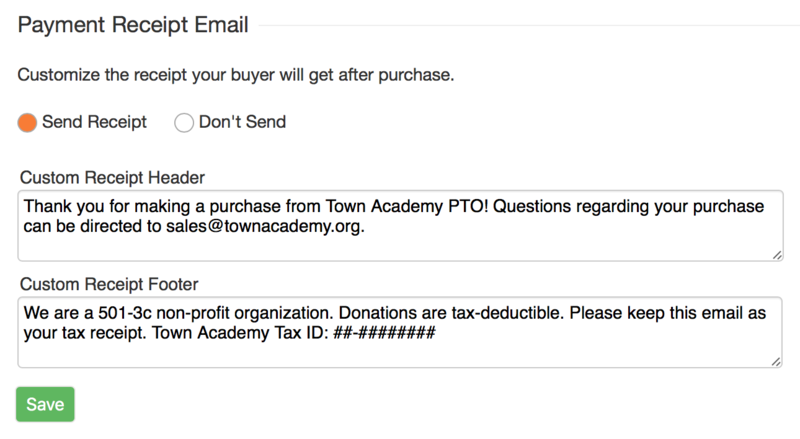 You can choose to have email receipts sent automatically to purchasers after their sales are complete. This is managed under Account Settings / Store / Activate. If you make use of this feature, be sure to customize your receipt header and footer. You don't need to repeat the name of your organization as it will appear just above your custom header. During Checkout, if your system defaults are set to allow the Pay-by-Check option, parents can generate a print invoice to accompany with payment. This invoice can (and should) be customized to provide payment instructions. Mention how checks should be made payable. In case they prefer to mail the check in, include mailing instructions. This is managed under Account Settings / Defaults. If you'd like to have your shoppers arrive at a webpage with a custom message after their purchase is complete, let us know the URL and we'll set your account to direct folks to that page after they finish their payment experience with PayPal.